T erry Albritton took several quick steps, turning 180 degrees to his left, planted his left foot firmly at the toe board, tensed his leg into a solid block, and hurled the ball of dull iron. The 16-pound shot flew 71 feet, 8'/ï¿½, inches. for a world record. Like most athletes, Albritton had coaches to help him refine his techniques. 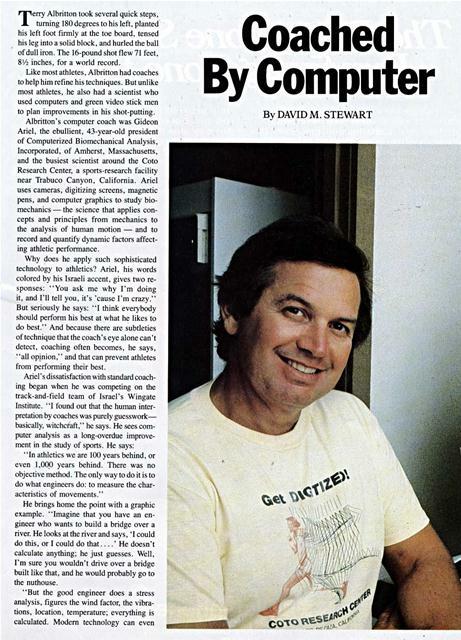 But unlike most athletes, he also had a scientist who used computers and green video stick men to plan improvements in his shot-putting. 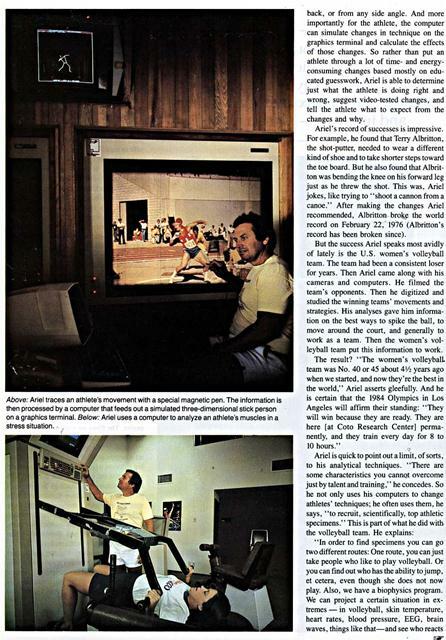 Albritton's computer coach was Gideon Ariel, the ebullient, 43-year-old president of Computerized Biomechanical Analysis, Incorporated, of Amherst. Massachusetts, and the busiest scientist around the Coto Research Center, a sports-research facility near Trabuco Canyon, California. Ariel uses cameras, digitizing screens. magnetic pens. 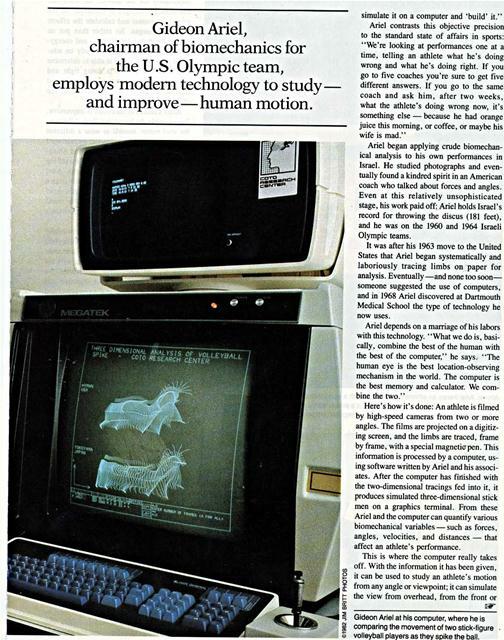 and computer graphics to study biomechanics - the science that applies concepts and principles from mechanics to the analysis of human motion - and to record and quantify dynamic factors affecting athletic performance. Why does he apply such sophisticated technology to athletics? Ariel, his words colored by his Israeli accent, gives two responses: "You ask me why I'm doing it, and I'll tell you, it's 'cause I'm crazy." But seriously he says: "I think everybody should perform his best at what he likes to do best." And because there are subtleties of technique that the coach's eye alone can't detect. coaching often becomes, he says, "all opinion." and that can prevent athletes from performing their best. "In athletics we are 100 years behind, or even 1,000 years behind. There was no objective method. 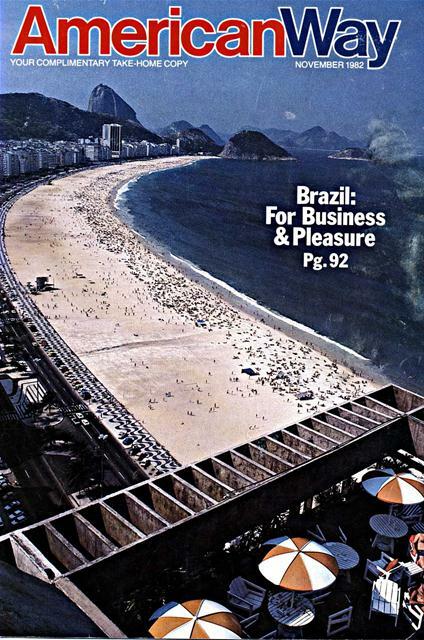 The only way to do it is to do what engineers do: to measure the characteristics of movements." He brings home the point with a graphic example. "Imagine that you have an engineer who wants to build a bridge over a river. He looks at the river and says, ' I could do this, or I could do that....' He doesn't calculate anything. he just guesses. Well, I'm sure you wouldn't drive over a bridge built like that, and he would probably go to the nuthouse. simulate it on a computer and 'build' it." Aricl contrasts this objective precision to the standard state of affairs in sports: "We're looking at performances one at a time, telling an athlete what he's doing wrong and what he's doing right. If you go to five coaches you're sure to get five different answers. If you go to the same coach and ask him, after two weeks, what the athlete's doing wrong now, it's something else - because he had orange juice this morning, or coffee, or maybe his wife is mad." Ariel began applying crude biomechanical analysis to his own performances in Israel. He studied photographs and eventually found a kindred spirit in an American coach who talked about forces and angles. Even at this relatively unsophisticated stage, his work paid off: Ariel holds Israel's record for throwing the discus (181 feet), and he was on the 1960 and 1964 Israeli Olympic teams. It was after his 1963 move to the United States that Ariel began systematically and laboriously tracing limbs on paper for analysis. Eventually -and none too soonsomeone suggested the use of computers, and in 1968 Ariel discovered at Dartmouth Medical School the type of technology he now uses. Ariel depends on a marriage of his labors with this technology. "What we do is, basically, combine the best of the human with the best of the computer," he says. "The human eye is the best location-observing mechanism in the world. The computer is the best memory and calculator. We combine the two." Here's how it's done: An athlete is filmed by high-speed cameras from two or more angles. The films arc projected on a digitizing screen, and the limbs are traced, frame by frame, with a special magnetic pen. This information is processed by a computer. using software written by Ariel and his associates. After the computer has finished with the two-dimensional tracings fed into it, it produces simulated three-dimensional stick men on a graphics terminal. From these Ariel and the computer can quantify various biomechanical variables-such as forces, angles, velocities, and distances - that affect an athlete's performance. Gideon Ariel at his computer, where he is comparing the movement of two stick-figure w volleyball players as they spike the ball. Above: Ariel traces an athlete's movement with a special magnetic pen. The information is then processed by a computer that feeds out a simulated three-dimensional stick person on a graphics terminal. Below: Ariel uses a computer to analyze an athlete's muscles in a stress situation. back, or from any side angle. And more importantly for the athlete, the computer can simulate changes in technique on the graphics terminal and calculate the effects of those changes. So rather than put an athlete through a lot of time- and energyconsuming changes based mostly on educated guesswork, Ariel is able to determine just what the athlete is doing right and wrong, suggest video-tested changes, and tell the athlete what to expect from the changes and why. Ariel's record of successes is impressive. For example, he found that Terry Albritton, the shot-putter. needed to wear a different kind of shoe and to take shorter steps toward the toe board. But he also found that Albritton was bending the knee on his forward leg just as he threw the shot. This was, Ariel jokes, like trying to "shoot a cannon from a canoe." After making the changes Ariel recommended, Albritton broke the world record on February 22, 1976 (Albritton's record has been broken since). But the success Ariel speaks most avidly of lately is the U.S. women's volleyball team. The team had been a consistent loser for years. Then Ariel came along with his cameras and computers. He filmed the team's opponents. Then he digitized and studied the winning teams' movements and strategies. His analyses gave him information on the best ways to spike the ball, to move around the court, and generally to work as a team. Then the women's volleyball team put this information to work. The result? "The women's volleyball. team was No. 40 or 45 about 4/2 years ago when we started, and now they're the best in the world," Ariel asserts gleefully. And he is certain that the 1984 Olympics in Los Angeles will affirm their standing: "They will win because they are ready. They are here [at Coto Research Center] permanently, and they train every day for 8 to 10 hours." to certain conditions in the most favorable ways to be a good volleyball player." Such a search can have dramatic effects. Ariel illustrates a very visible change: "The average height of the women was five foot, six inches or five foot, seven; now it's six foot, two. You play volleyball by how high you can jump above the net, so you can't play with a bunch of fantastic midgets." Ariel's library of floppy-disk "recordings" from his computer boasts some of the biggest names in sports. He can show you stick men who have Jack Nicklaus's golf drive, Jimmy Connors's tennis serve, Bill Rodgers's marathon stride, Muhammad Ali's boxing sting-and even a stick horse with the gait of 1979 Kentucky Derbywinner Spectacular Bid. He has worked with the Kansas City Chiefs in football and the Kansas City Royals in baseball and is using a newly developed technique called "formation analysis" with the Dallas Cowboys. He is currently chairman of the biomechanics committee for the 1984 U.S. Olympic team. Yet Ariel's work is not limited to the athletes themselves. In fact, his bread and butter at the research center and with his company is sporting-equipment development. He has developed tennis and racketball rackets, golf clubs, inexpensive but high-quality athletic footwear, and even a running shoe with a microchip implanted in its sole. "They had to wait for the proper time, when the consumer could appreciate computers. They couldn't market it when people didn't know what they were talking about. Today every little kid - you give him an object in his hand and he's looking for the keyboard." Even beyond the athletic arena, Ariel is finding important applications, for his biomechanical computer analysis. He has worked on designs for safer automobile seats and automatic syringes, and he has done studies of eye movement and verifications of insurance claims in injury cases. Still, Ariel finds his work with athletes most rewarding, as one would expect of a man who finishes a five-mile run, gives an interview, and then goes on to his evening weight-lifting session. David M. Stewart is a part-time free lance based near Detroit. Generated on 4/25/2019 11:03:33 AM (PST) ADI/HQ/GBA/2019/ARIELCLOUD/v3.0.2018.0126.